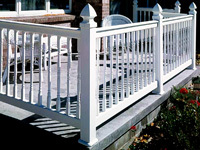 Kingston railing uses connectors that attach to 4x4 wood posts inside the vinyl posts, available in White. 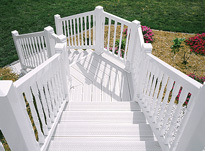 with Lifetime non-prorated limited warranty. 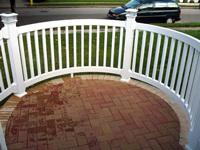 *Sorry All products on this page Coming Soon!! 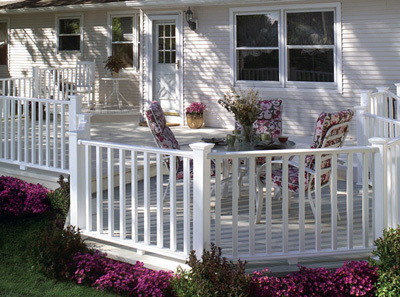 Kingston railing uses connectors that attach to 4x4 wood posts inside the vinyl posts, available in White and Clay, No scraping, sanding or painting, Simple yet secure installation Environmentally friendly with a Lifetime non-prorated limited warranty. 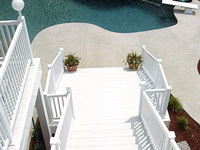 Oxford "T" Top Rail with choices of Baluster or Square Picket, 6', 8' and 10' lengths in Flat configurations, 6' and 8' lengths in Stair configurations, uses routed posts with no visible connectors, available in White and Tan, No scraping, sanding or painting Simple yet secure installation environmentally friendly Compliments our fence systems With a Lifetime non-prorated limite warranty.